Bicycle Crunches are one of my favorite ab exercises and nearly all of my clients do them during their ab workouts. The Bicycle maneuver actually was listed at the top of the list in a scientific study on the most effective abdominal exercises. It's a rhythmic exercise that works all parts of the abs, and my clients can see improvements in their ab strength when they do them consistently. It's one of the best ab exercises. When I owned a fitness business, I taught boot camp classes, and the bicycle crunch was a staple of the ab workout. When I first introduced the class, the participants could only do between 15-20 repetitions before feeling like their stomach was on fire. But as we kept working, most of them built up to 100 repetitions per set without resting. I remember the first time I said to them I want them to aim for 100 reps. They looked at me like I was crazy, and some people just flat out told me I was crazy. But, when I hit my stop watch and said, "Go! ", they all went to work. No one quit, and everyone made it to 100-- even though it took some longer than others. I could see the proud looks on their faces, and they could see the proud look on mine. It was one of the best classes I ever taught and, it was a memorable time in my business life. Sorry for the digression, I was just reminiscing about the first gym I owned. At any rate, bicycle crunches can be done anywhere, including your living room floor. And here's a few tips about doing them correctly. Starting Position: Lie on your back with your hips bent about 90 degrees and your hands behind your head. Form: As you curl your body forward, like in a crunch, bring your right knee towards your left elbow and extend your left leg out 45 degrees. While keeping you shoulders lifted off the floor continue alternating from left to right, bringing your opposite knees and elbows together. Personal Trainer Tips: Keeping your shoulders lifted off the floor keeps more tension on the abs and works them harder. The tempo and repetitions can vary for this exercise. Slow tempo and fewer reps (15 each side) help a little more with firming. Fast tempo and more reps (50 each side) help more with fat burning. The Bicycle Crunch is really one of my favorite exercises, and here's a quick workout tip. Workout Tip: If you are doing other exercises that are on a bench, such as chest flyes or chest presses, perform bicycle crunches in between sets to get some extra ab work in. That is chest flye- bicycle - chest flye- bicycle (for 3 sets). This is called the super set technique. A super set is simply when you take two exercises and do them in alternating fashion with little rest between exercises. A main benefit is that you can get more done in less time. Another bonus is that the bench is usually a little softer and less stable than the floor, so your ab muscles will work a slightly harder to help maintain your balance. If you feel like you neglect your abs during your workouts, use supersets and put them in the middle of your workout so you don't rush off and skip them. 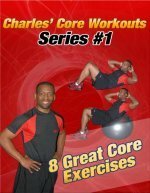 I teach this technique to my clients, so that they can get more core strengthening in their workout without spending 2 hours in the gym. Try doing super sets in your next workout, or clear a place on the floor tonight before you get settled on the sofa.